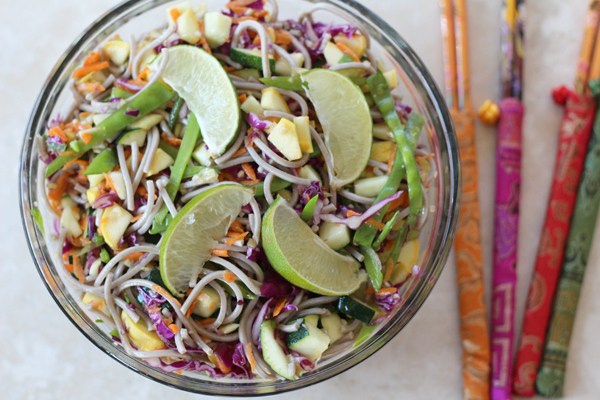 Rainbow Soba Noodle Salad - Make this winner for dinner salad recipe with colorful and crisp vegetables, buckwheat soba noodles, and a sesame ginger dressing. Prep the vegetables. Place in large bowl. Cook the soba noodles (about 2 minutes in boiling water). Drain and put them directly into ice water (prevents stickiness). Meanwhile, mix the sesame oil, red chili oil, honey, fresh ginger and garlic. Pour it over the vegetables. Drain the noodles a second time. Add them to the vegetables and mix. Serve with fresh lime wedges and sprinkling of sesame seeds.